Improving what for years has been the benchmark in Trial is always difficult, but once again the Tuscany House has managed to make a major development in its 2013 EVO models, starting with the introduction of a technology that has never been previously applied in the Trial market. 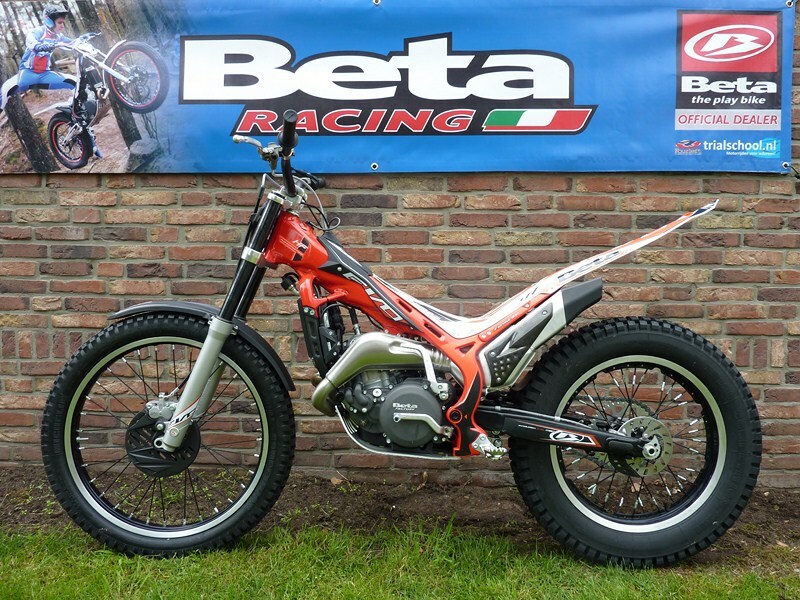 The new 2013 EVO is in fact the first trial bike in the World to use a frame where the main section is obtained by hydroforming with all the advantages that this technology allows. Ease of maintenance, friendly riding, and ergonomics are further improved on the 2013’s by raising the bar to an even higher level of quality in the EVO family. The experience gained in the last year of racing and the constant research for new technical solutions, have led to an excellent product under any point of view. The 2013 EVO is therefore an excellent bike able to compete at the highest levels in national and international competitions and at the same time allows hobby riders to discover how easy the new EVO is to ride..
• New frame obtained by hydroforming: the application of this technology has allows a frame with better mechanical features, lighter (- 250 grams), more rigid, with a larger capacity fuel tank (+ 250cc) and a unique aesthetic. The red color compliments the new shape of the frame and reinforces the look of the bike. • Rear fender: the rear fender is completely new, with a slim design, it includes a cover in the “seat” area to access the air filter box. This allows to speed up and simplify inspection, maintenance and replacement of air filter. • Side covers: now made in one piece, they are a real tank cover, and through their sculpted forms, enhance the aggressive spirit of the 2013 EVO. • Stand: made of forged aluminum, stronger in design yet it is over 100 grams lighter. It also improves the general aesthetics of the vehicle. • Rear Shock: revised with new internal components and a new hydraulic, it has a different setting which allows to use at its best the agility of the new EVO. • Front Fork: new setting for a most progressive feeling with the front wheel. • CDI: placed under the rear fender, it is more secure and less prone to accidental damage in the event of a fall. • Regulator: located at the rear of the engine for simplification of the electrical system. • Electrical system: the repositioning of the CDI unit and the regulator has allowed us to define a new layout of the electrical system that is streamlined and simplified for greater efficiency and better look. • Light/Map Switch: mounted on the side to avoid damage, it also houses the switch for the dual mapping settings. • Kill Button: positioned on the handlebar for practicality and ease of use. • Color and graphics: frame is now red ( to inspire power and racing feeling ) while plastics are white and matt black. The new graphics highlight the innovative shapes of the chassis and plastics, escalating the racing look of the 2013 EVO **. • Shift drum: New shift drum with a modified shape to allow smooth action of the gearbox, greater fluidity and precise riding. • CDI: a new timing curve has been developed to optimize power delivery and provide an immediate feeling with the bike. This allows the rider to be comfortable in any situation and condition of land. From a performance point of view a greater torque at low rpm and a never ending top end have been obtained. Improving what for years has been the benchmark in Trial is always difficult, but once again the Tuscany House has managed to make a major development in its 2013 EVO models, starting with the introduction of a technology that has never been previously applied in the Trial market. The new 2013 EVO is in fact the first trial bike in the World to use a frame where the main section is obtained by hydroforming with all the advantages that this technology allows. Ease of maintenance, friendly riding, and ergonomics are further improved on the 2013’s by raising the bar to an even higher level of quality in the EVO family.The experience gained in the last year of racing and the constant research for new technical solutions, have led to an excellent product under any point of view.Donato Miglio, Beta Trial Factory Team Manager, describes the EVO 2013: “Powerful and easy for riders of any level, the bike is extremely versatile with a great travel range. From your first ride you feel the EVO was made for your needs.”The 2013 EVO is therefore an excellent bike able to compete at the highest levels in national and international competitions and at the same time allows hobby riders to discover how easy the new EVO is to ride.. FRAME:• New frame obtained by hydroforming: the application of this technology has allows a frame with better mechanical features, lighter (- 250 grams), more rigid, with a larger capacity fuel tank (+ 250cc) and a unique aesthetic. The red color compliments the new shape of the frame and reinforces the look of the bike.• Rear fender: the rear fender is completely new, with a slim design, it includes a cover in the “seat” area to access the air filter box. This allows to speed up and simplify inspection, maintenance and replacement of air filter. • Side covers: now made in one piece, they are a real tank cover, and through their sculpted forms, enhance the aggressive spirit of the 2013 EVO. • Stand: made of forged aluminum, stronger in design yet it is over 100 grams lighter. It also improves the general aesthetics of the vehicle. • Rear Shock: revised with new internal components and a new hydraulic, it has a different setting which allows to use at its best the agility of the new EVO. • Front Fork: new setting for a most progressive feeling with the front wheel. • CDI: placed under the rear fender, it is more secure and less prone to accidental damage in the event of a fall.• Regulator: located at the rear of the engine for simplification of the electrical system. • Electrical system: the repositioning of the CDI unit and the regulator has allowed us to define a new layout of the electrical system that is streamlined and simplified for greater efficiency and better look.• Light/Map Switch: mounted on the side to avoid damage, it also houses the switch for the dual mapping settings. • Kill Button: positioned on the handlebar for practicality and ease of use.• Color and graphics: frame is now red ( to inspire power and racing feeling ) while plastics are white and matt black. The new graphics highlight the innovative shapes of the chassis and plastics, escalating the racing look of the 2013 EVO **. ENGINE:• Shift drum: New shift drum with a modified shape to allow smooth action of the gearbox, greater fluidity and precise riding. • CDI: a new timing curve has been developed to optimize power delivery and provide an immediate feeling with the bike. This allows the rider to be comfortable in any situation and condition of land. From a performance point of view a greater torque at low rpm and a never ending top end have been obtained. Onderstaand de standaardprijzen van de beta modellen 2011(*), verstrekt door Beta importeur Nederland, Kamphuis Trading.